Pears have many varieties and come in an array of colors. They’re also a great source of phytonutrients and anti-inflammatory antioxidants. Unfortunately, pears often contain pesticide residue and are advised to be purchased from organic growers. 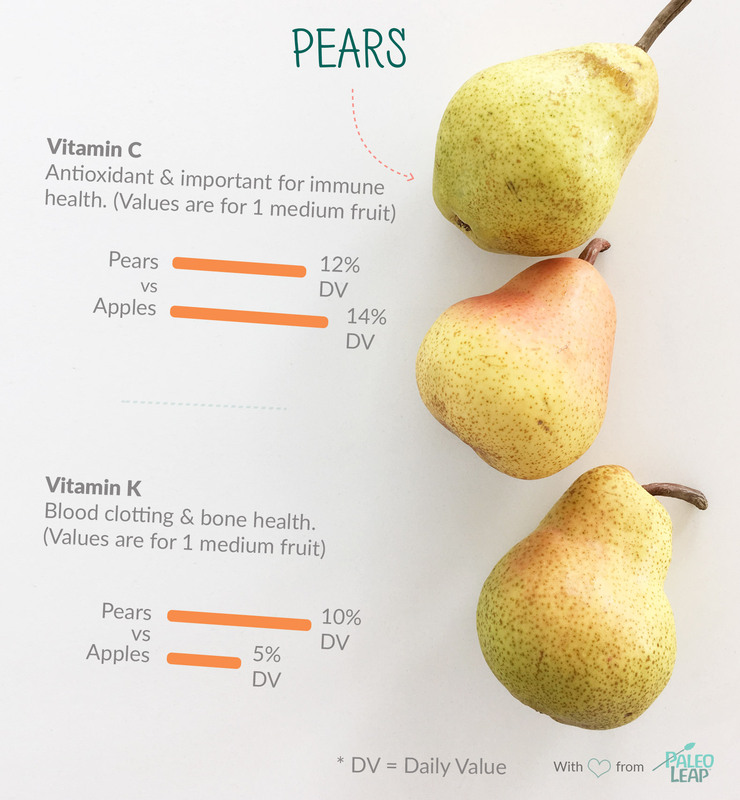 Because pears are easy to digest, many give pureed pears to their infants as one of their first foods — another reason to purchase organic pears when possible. Orange dots show how 1 medium pear fits into the typical nutrient profile of a Paleo meal. Pears found in the store will often be firm and unripe, and need a few days to ripen. Press on the top of the pear; if it gives to the pressure, then the pear is ready to eat. If the top is too soft, the pear is overripe. Lightly speckled pears are fine, but avoid pears with bruises or dark soft spots. VARIETIES: Pears comes in many different colors and varieties. Common varieties include Bartlett, Bosc and Comice. GROWERS: China is the largest producer of pears. In the US, the state of Washington is the largest grower of pears. KEEP FRESH: Like apples, when pears are cut, they quickly turn brown in color. Squeeze a bit of lemon or lime juice on the pear to keep them from discoloring. Slice a pear and wrap each slice with a piece of prosciutto and sprinkle with cinnamon. Serve pears, arugula, walnuts and pancetta with a tangy vinaigrette for a delicious salad. Heat butter in a skillet and cook pears cut side down until browned. Add cinnamon, nutmeg and a dollop of coconut cream. Caramelize pears with spices and serve alongside chicken or pork.